As we ended the year and look back a lot happened and we can only hope that there will be an equal level of activity in 2018. Finally in December we had a chance to catch up on "filing" or putting away all the coins in VAM order. With 924 coins this can be quite a chore. But it is done and we also took the time to update our submission list so that there is a reference back to the submissions when there are questions. In mid December we received the images for forty-two coins from VSS and now have them up on the web site. This brings our inventory on the web site to 9xx coins and now with over 9,000 images for study. This batch of coins was a little unusual because we had a grade distribution that was a little more skewed toward the middle. 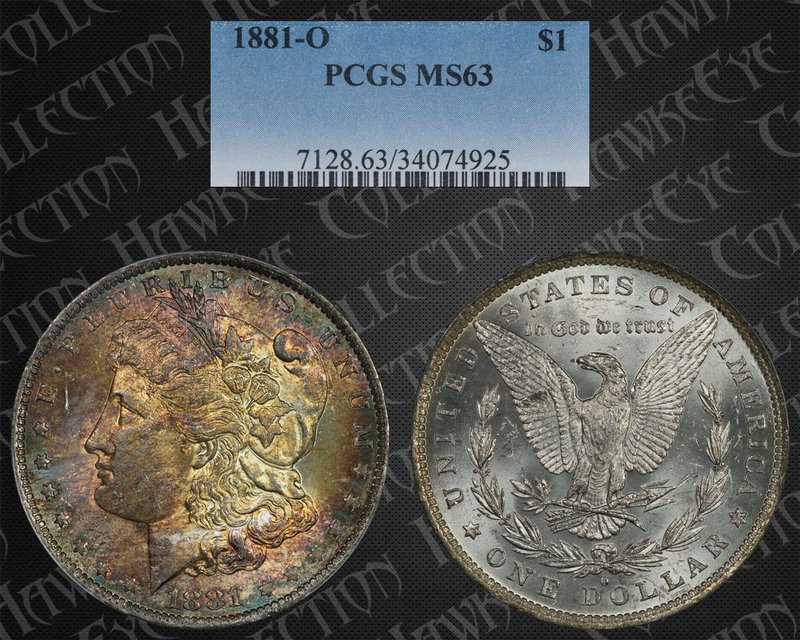 But there were more PCGS VAMmed coins than normal also. VSS submitted a number of items for LVA to consider in the upcoming supplement. We have enough examples to hopefully combine or eliminate some older VAMs with little to no documentation. Hopefully these will be accepted . In 2018 we will cross over 1,000 coins in the inventory and now cover almost 90% of recognized VAMs with documentation and photographs. As always we are appreciative of the help from VSS for both VAM verification and photography. 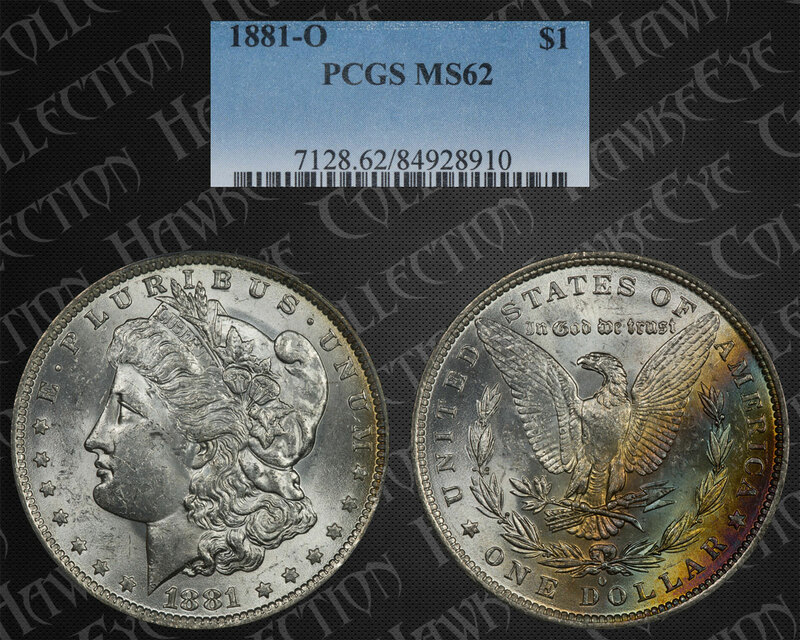 Organizationally we reached the point that trying to maintain the single page with an image of every coin in our inventory was impractical. For some just loading this page was difficult. So we made a change to that page to show a representation of each grade and a direct link to that grade from the image. Hopefully this will improve navigation and helps us with site maintenance. If you watched the National Championship game you saw a thriller, but not a good one for DAWG fans. Alabama only led once during the game, and only for one second. But it was the last second and that is what counts. On to 2018 and hopefully a better outcome! 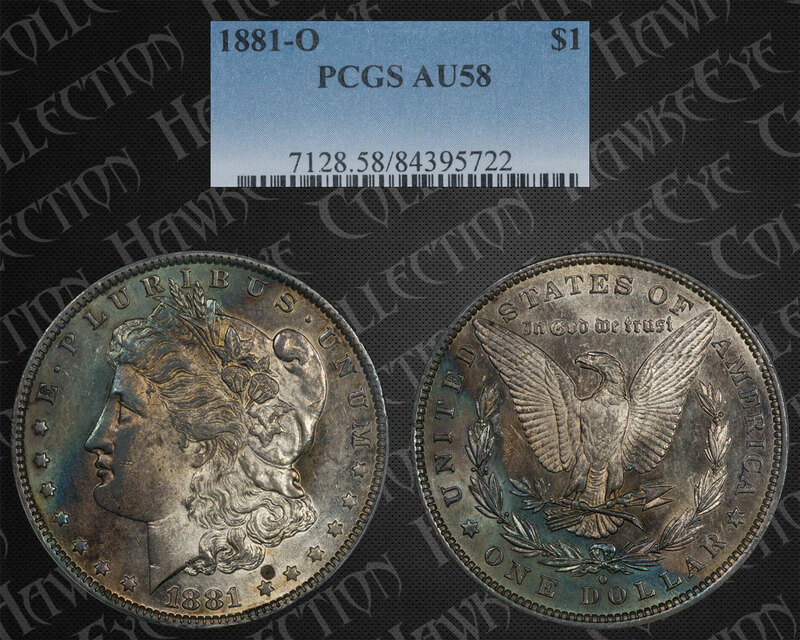 Our latest group of coins back from VSS has a number of nicely toned coins in the group. You can click on any of the images for a larger view. We continue to work on the reverse die fingerprints and we are making some progress. This month we only tackled Die b because we were reworking other areas of the web site to make them more functional. The analysis of Die b is listed below. We burned the midnight oil a little last night and got the pricing update done with current PCGS prices as of December 31, 2017. We all know the prices for both gold and silver have been really soft, but fortunately for us the price of silver has little to do with the coin prices. But we have seen that prices for coins from Mint State 64 and up have been retreating on about half the grades. So some collectors as well as investors are feeling the retreat. Perhaps a good time to buy, but tough if you are selling. The toughest grades were MS65DMPL and MS66. Usually these will be investment grade and beyond the reach of collectors, but the pricing here has been brutal. MS65DMPL coins lost 15.7% of their value $2,044, just in the last year. From peak pricing back in 2009 it has lost 71.6% of its value or $27,700. On a percentage basis the MS66 did a little better, or not as bad. It lost 52.3% of its value or $11,500 from the peak price back in 2012. But 2017 was also brutal with the price falling 33.8% or %5,362. Simply said it has been a good time to be a collector and a bad time to be an investor. New VAM 1D "Flaky Eye"
Included in this month's inventory additions are some nice VAM 1D "Flaky" Eye examples. 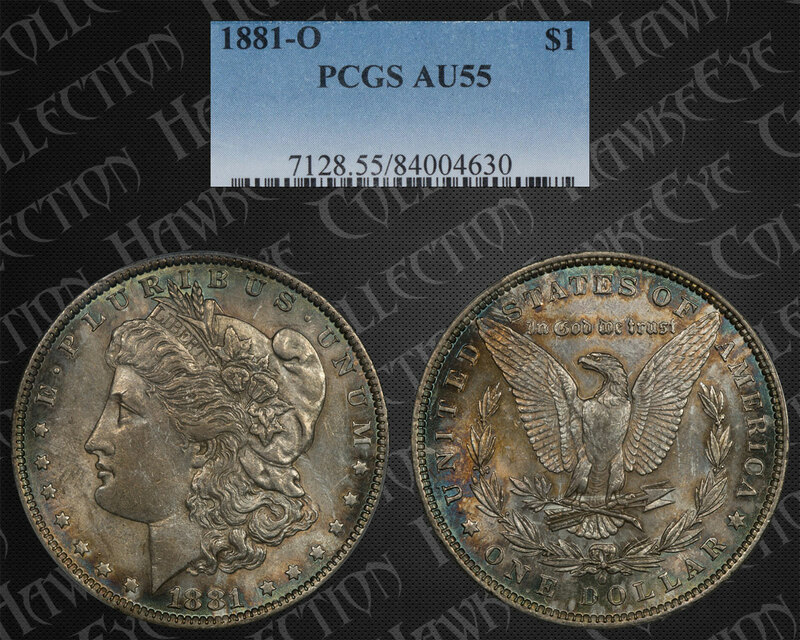 One of those is PCGS 34074897 , a Mint State 61 Pl coin. ​ The deterioration of the eye socket is early and the eyelash complete enough that we believe this coin was struck early in the die use. ​ The rather unusual area in front of the neck that we believe looks a bit like feathers also is very light. This probably indicates that this feature increased as the eye socket deteriorated. It might even be possible for the material lost around the eye accumulated around the neck on the die. But we would need a lot more evidence to prove this one. With the addition of this coin we now have VAM 1D examples in eleven different grades. Reverse Die b makes an appearance only with VAMs 2, 2A, and 2B. Logically it appears on all three and the die cracks confirm the die use. But another question is "Which came first, second, and third?". In most cases you will need to click on the coin image below to fully appreciate the die cracks. Also, with all three VAMs the dies show signs of softening toward the denticles, so all three may be related to other VAMs where the same die was used and then "touched up" for reuse. 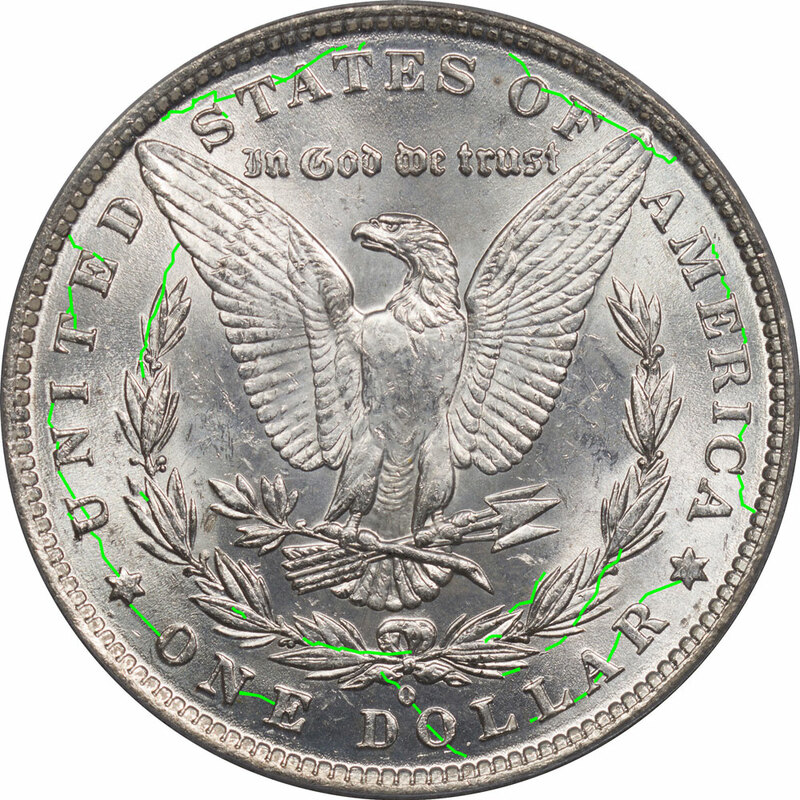 The above coin is a VAM 2 - O/O Low and it exhibits die cracks primarily around the perimeter of the coin. We have seven examples of VAM 2 in December 2017 and more than half are mint state. The area that most clearly demonstrates the differences in the three VAMs is the lower left quadrant. The above coin is a VAM 2A - O/O Low, Spike in 8. We have eight examples as of December 2017 and all but one is mint state. So there is plenty of inventory for comparison. 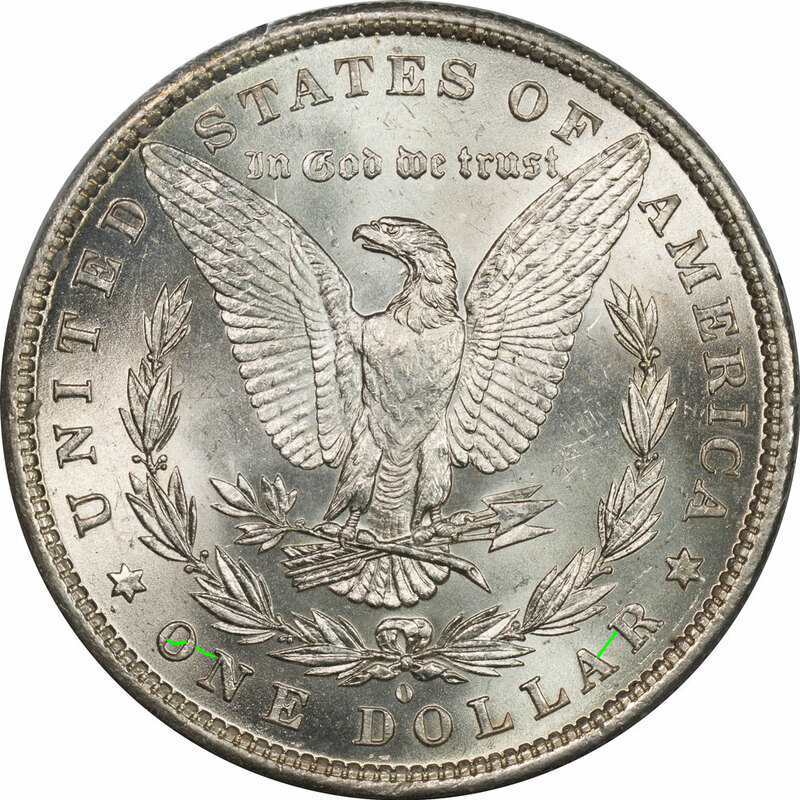 As the VAM title implies, the differentiation for the VAM designation is on the obverse die with the familiar Spike in 8 feature for the 1881-O series. When forming VAM 2A the Reverse Die b exhibits many more die cracks than for VAM 2. This would indicate a more advanced state of die deterioration, but may not be the final use of the die. The cracks appear all around the perimeter of the die, and also get into the wreaths, and through the mint mark. The above coin is a VAM 2B - O/O Low, Pitted NE-D and it shows very minor die cracks below the wreaths in just minor areas of the legend. We have only two examples of VAM 2B, but they are both mint state coins and good study examples. Usually you might think that the use and deterioration of the die can be determined only by the progression of the die cracks, or the appearance of clashing. But in this case there are more clues. All of the VAMs (2, 2A, and 2B) are clashed so that offers little clue. But dies were often pulled from service, repolished, and then put back in service. 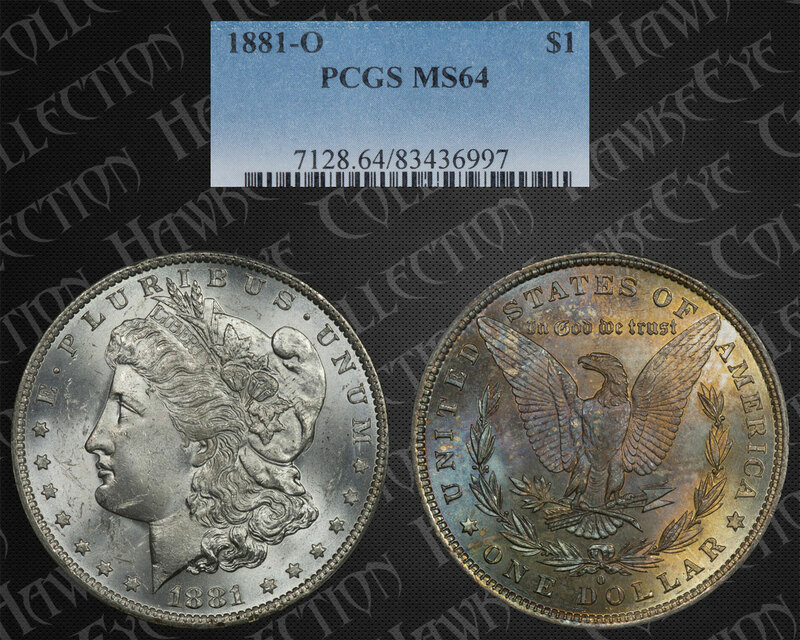 Sometimes they were paired with the same physical obverse die, and sometimes not. All of the obverse dies for the VAMs are designated as Die 1, but they all have slightly different traits. When we look at Reverse Die b in these pairings we can see the progression of the polishing in the right wing area. Also, the beard under the eagle's neck also appears to become weaker as you go through this progression. If we believe that die polishing and loss of detail tells a story about sequence of use then the likely sequence would have been 2B, 2, and the 2A. This means that the die developed some minor cracks in the lower Legend and some minor pitting near the bottom rim while creating VAM 2B. It was pulled from service and then reused to create VAM 2, where it developed the same cracks. These cracks lengthened and caused the die to be polished again. In VAM 2A, this final use of the die caused the cracks to reappear, and this time severely enough that the die may have been retired. But that leads to another question and that is progression outside of the VAM 2 sequence. The Eagle's wing on VAM 2B is already softened a little, and while this could be the earliest use of Reverse Die b, it seems unlikely to us. Perhaps there are additional clues on the die about connections to others.